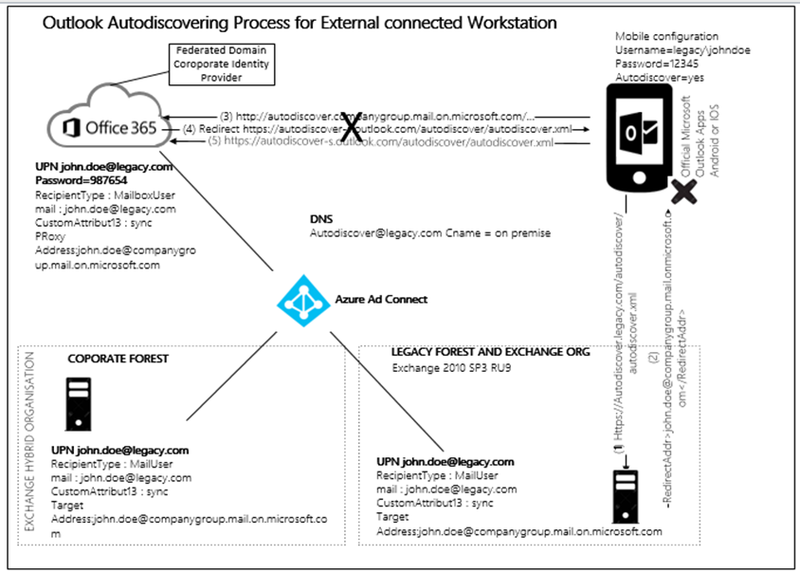 John.Doe@legacy.com use an Outlook 2016 and Office 2016 Microsoft Mobile application that use autodiscover from external to retrieve the on-premise connection point. The mobile application is set with an account and password that match the legacy identity of the account in Promise that own the mailbox. When the mailbox is migrated from this agency in the 0365 tenant environment the mailbox in Office 365 is associated with the User AD account synchronized with the corporate Ad user. When a Microsoft Outlook Mobile apps from a 4G will try to get his mailbox, he will perform an autodiscover and will use his agency credentials to get this file from the On-premise organization. Then the mobile will be redirected. As this step the redirection we suspect that, it will fail because the Mobile do know how to handle this redirection. The question is how to force the mobile to retrieve the new connection point? 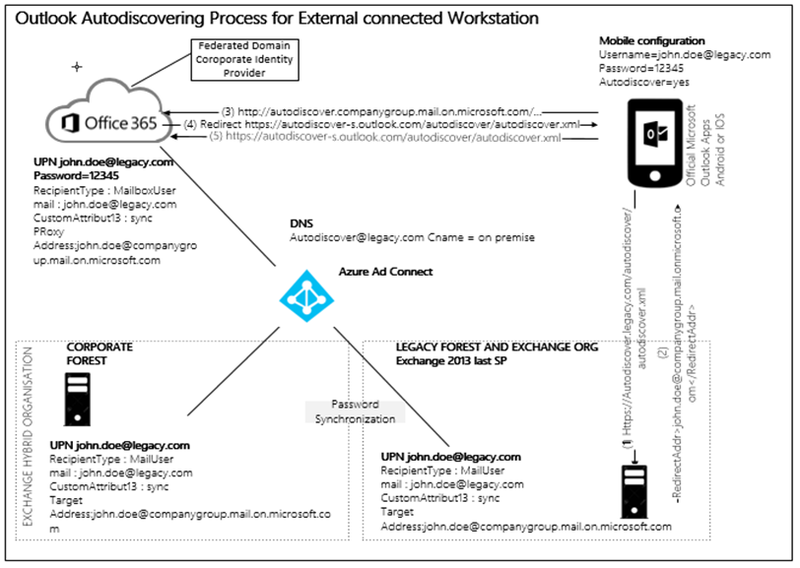 MDM?, Exchange 2013 Client Access server migration (https://blogs.technet.microsoft.com/exchange/2015/03/23/exchange-activesync-on-boarding-to-office-365/)? All on-premises Exchange 2010 Client Access servers handling EAS requests must be running at least Service Pack 3 RU9. Exchange 2013 Mailbox roles handling EAS requests must be running CU8. The EAS version on the device should be 14 or higher, and the device must be able to handle 451 redirect responses. The Exchange on-premises organization has successfully set up hybrid with their Office 365 tenant. The OrganizationRelationship object must exist in the on-premises Active Directory environment and the TargetOWAURL should be populated with the Office 365 URL. First question: How to know if devices are able to handle 451 redirect responses? On IOS / on Android? « The username and password for the user must remain the same after the move to Office 365. The user experience will not be seamless if the username or password is changed after the mailbox is moved to Office 365 ». In our environment the user credentials are not the same because (but could be a solution) we are integrating a new subsidiary with a legacy Active Directory Forest. Let assume that we could publish The OrganizationRelationship in the on-premises legacy Active Directory environment and the TargetOWAURL populated with the Office 365 URL.